Just what is a game jam? It is a short event, usually only a day or two, where game developers plan, design and create a short game. Similar to a music jam session, game jams don't involve much pre-planning and rely on immediate idea generation and improvisation. Game design companies have these jam sessions regularly, and while many of the games that happen here are digital, some are paper-based. They usually occur in one physical location to allow for immediate, organic collaboration. While there is an element of competition, most of the work is focused on collaboration towards a common goal. I have witnessed some of these game jams, and have talked with many gaming experts to learn more about it. I wanted to learn more about game jams to help me come up with ideas for how we might include an activity like this in classroom instruction. GameDesk + Epicenter Game Jam at the d.school -030213 from Epicenter on Vimeo. If you watch the video above, you will see the room change -- literally. The room is set up in a way that allows for presentation, small group work, space for making and more. Make sure you have the space or can create a space that is fluid and can easy be transformed to meet the needs of the teams and the steps in the game jam process. As teams create and decide upon their games, they will need materials to do so. However, don't assume that a game jam is only about creating digital games. While jammers might use a digital tool like Gamestar Mechanic to create their game, they might also use physical materials like paper, glue, magazines and scissors. Have these materials available, and provide voice and choice for students to pick what materials will best meet their needs. At a GameDesk game jam, a team developed a pizza game that was aligned to math content about fractions. This game was created with physical, not digital, materials. A game jam is a great opportunity to teach fundamentals of game design, from story line and narrative to the actual mechanics. Normally, participants in game jams come to it with a lot of prior knowledge, although many game jam teams have members with very little knowledge of these mechanics. The extent to which you teach this might depend on the level of students or time constraints in the classroom. However, since the game jam is in essence a design challenge, you can align to principles of STEM or STEAM education. Make sure to give students designated time before the game jam to learn these principles. This is probably one of the most interesting steps of the game jam. Here, the teams investigate specific content areas (or domains) and uncover how the content is both taught and represented. For example, teams can find specific learning targets in their game content, and also note how those targets are represented visually or digitally. They research how the content is traditionally taught and also assessed. Teams craft specific learning targets from this exploration and research to ensure that, when they get to the idea phase, they can create a focused game targeting very specific learning objectives. Game jams always start with team builders. 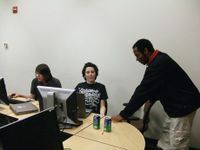 In a real game jam, the team members have often never worked together before; therefore, it's crucial to set a tone for collaboration and problem solving. It's the same for our students. In order to set them up for success, icebreakers and other team builders need to occur. After bonding as a team and analyzing content domains, the ideation phase begins. This is where teams brainstorm and collaborate on ideas for the game itself. Relying on its collective knowledge of game design and content, the team starts to craft ideas for a game that will target a specific learning objective. These objectives are tight, and there are often not too many of them. They are created in the Domain Analysis component (step 4 above), but here the team gets to start narrowing and picking these targets as well as decide on the mechanics. The game jam itself has a very specific deadline, usually a full day (eight hours) of work, including the presentations and pitches. However within the game jam day, there are further benchmarks. For example, at some point during the day, teams are no longer allowed to generate game ideas and are forced to work or "make." This helps create the urgency for the deadline and also helps to move along the process. Consider setting specific time limits for some of the steps in the game jam. The culminating event for the game jam is presenting the game product and having all participants play the game. Not only is this an important assessment, but it is also an important way to celebrate the jammers' hard work. Judges need to have specific criteria for evaluating the games. These criteria might be different for every game jam. They might include relevance to content or curriculum, marketability, player interest, ability to collaborate, and more. As you consider a game jam for your classroom, you might focus the assessment on the content area, or simply on 21st century skills like creativity and collaboration. I know many of us have more freedom after "testing season," so that also might be a great time to give this idea a shot. Just make sure you're clear on the learning objectives and project outcomes that you expect from your students. Don’t forget to watch the game jammers in action in the time-lapse video above to give you a full picture of what it would look like!